Thinking of relaxing without leaving your home? 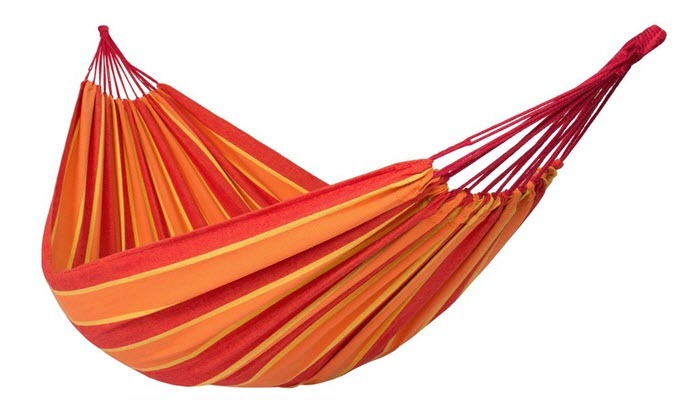 Get the best backyard hammock! It’s a great way to enjoy the outdoors in the comfort of your home. In choosing, however, take note that there are different types of hammocks and they have different pros and cons. Choosing a hammock also depends on your taste or the style of your backyard. It will also depend highly on where you would hang it. Make sure that the place you’ll hang your hammock isn’t just comfortable but safe, too. If it’s your first time to install a hammock, you might be surprised that there are so many different ways to hang your hammock. 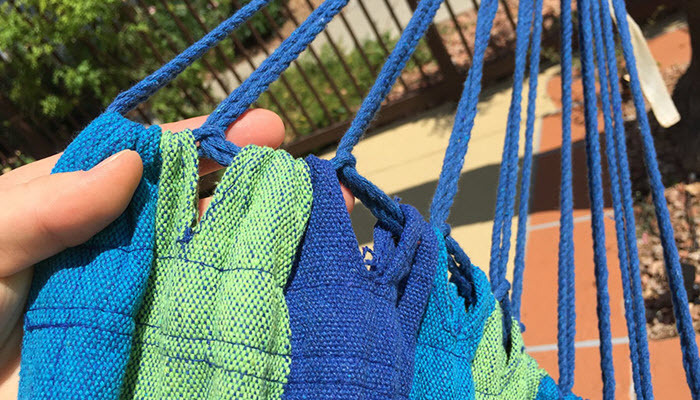 If you’re still not feeling confident, you also check out these hammock installation tips. As for our top picks, scroll down to see which hammock will fit your preference and budget. 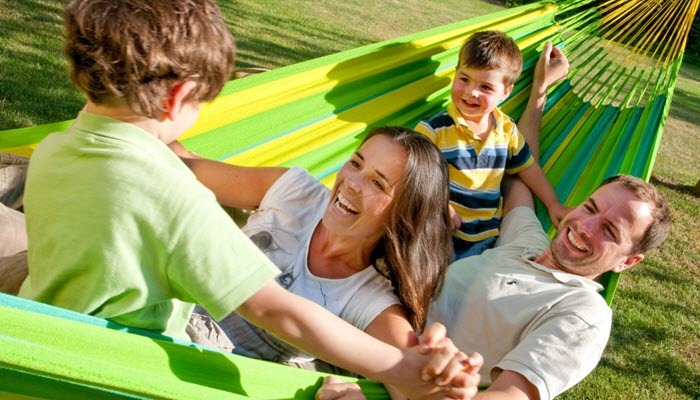 Number one on our list is the Newdora Multifunctional Lightweight Hammock. This is a high quality hammock that is super durable. It can hold up to 600 pounds and lasts for years. This hammock is strong but it is also soft and comfortable. The material is silky and lightweight, and it offers a lot of room so you are not cramped inside. It’s made of parachute nylon fabric so you don’t get hot inside. 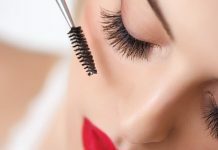 This is also easy to clean. Since you will put it outside, it is likely that it will get wet sometimes from the rain and the great thing is the material easily dries. This hammock is versatile and can be used not just for your backyard. You can bring it when hiking, camping or traveling, or you can use it on the beach. 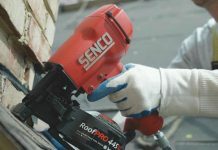 It’s easy to fix with its two binding strings that you can tie around trees or poles. Running second is the Best Choice Products Hammock Quilted Fabric with Pillow Double Size Spreader Bar. This quilted hammock offers great comfort especially with its pillow attachment. The quilted fabric comes in different warm color combinations which will help accentuate your backyard. It’s very sturdy and easy to install. It comes with 2 suspension rings, 2 S-hooks, and chains so you can easily set it up against a pole. This hammock can accommodate two people so it’s also great for a romantic relaxation in your backyard. It’s portable so you can bring it with you when you travel and includes a carrying case for convenience. The Hammock Sky Brazilian Double Hammock is an excellent alternative. It has a cocoon design and is made of cotton so it’s ultra lightweight and would actually make you feel weightless inside. The cotton is tightly woven with long lasting threads so it feels like you’re lying on a soft sponge surface. It’s good for two people so it’s perfect for couples but is also great for the whole family. 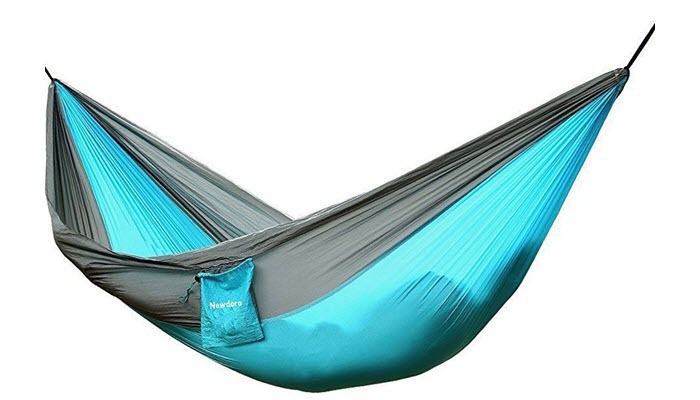 This hammock is also portable and comes with a carry bag for easy transportation. It also offers a lifetime warranty. 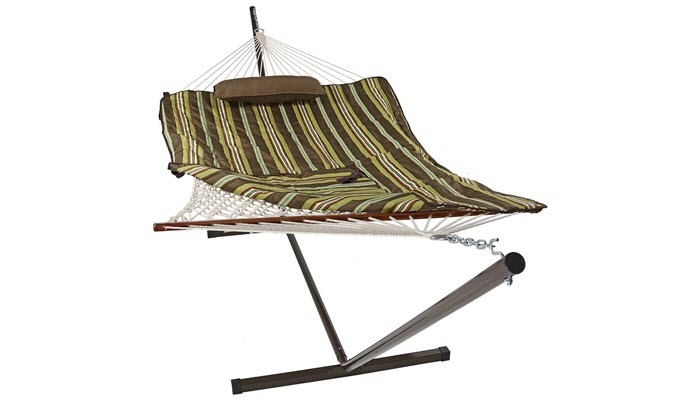 You should also consider the Sunnydaze Desert Stripe Cotton Rope Hammock which comes with a stand. 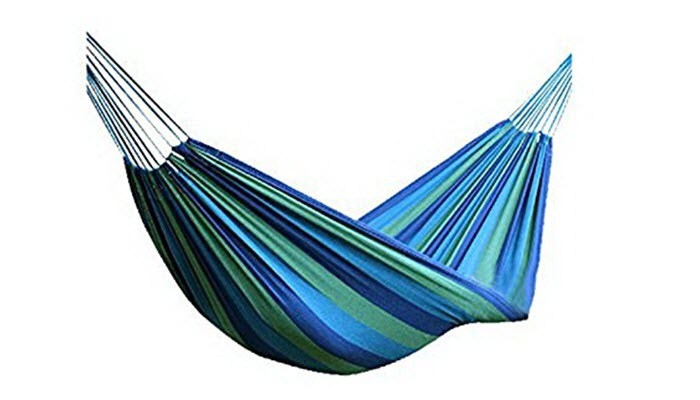 Instead of hanging it on poles, this hammock includes a steel hammock stand and cotton ropes for you to set up your hammock. It also comes with a polyester sleeping pad and pillow so it’s super comfortable. It’s weather resistant so you can leave it outdoors in your backyard. The great thing about not having to tie on the tree is that you can actually put it underneath and enjoy the shade of the leaves. You’ll be sure to enjoy a lazy day under nice warm weather. 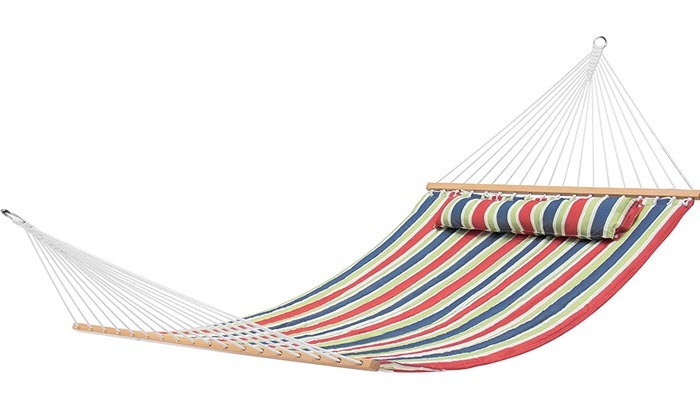 If you don’t want to spend a lot for your backyard hammock, we highly recommend the Merry Xmas Canvas Striped Outdoor Hammock. It’s made of canvas so it’s comfortable enough and it’s also portable. You can bring it for camping, hiking, or picnics. It comes in nice blue stripes so it’s cool to the eyes. Comfort is not the only factor to consider when choosing a backyard hammock though it is of paramount importance. Otherwise, you will not enjoy staying in your hammock. It also needs to be durable and since you’re placing it in your backyard, it has to withstand the outdoors. First, you need to decide what type of hammock you want to install. As you saw from the choices above, there is more than just one type of hammock. Rope hammocks are the most popular type and are usually made of synthetic or cotton ropes. Cotton is softer and if the hammock doesn’t include a pad, it is more comfortable and soft to the skin than the synthetic one. There are also fabric hammocks that are often more affordable. Hammock chairs are more convenient since you don’t need to worry about tying them up to a pole or tree. They are available in various styles and usually comes with sleeping pads. The most comfortable materials for hammocks are cotton and parachute nylon. They are also very durable. A canvas hammock may not be as comfortable but they’re quite inexpensive. So if you’re not anticipating to spend a lot of time in it, it might be a good choice. It’s not just the weight capacity that you need to consider. You also need to know the weight of the hammock itself. A lightweight hammock that is durable enough is the perfect kind because then, it can withstand a heavier load. It will also be extra comfortable. You need to make sure that your hammock can withstand outside conditions. There are hammocks that are weather resistant. It will also be great if the hammock’s material can easily dry since it can get wet from the rain outside. There are other special types of hammocks if you are not so tight on budget. Some hammocks are good for two people and others are more versatile like portable ones which you can bring when traveling.